The period between 602 and 717 is one of great upheaval. 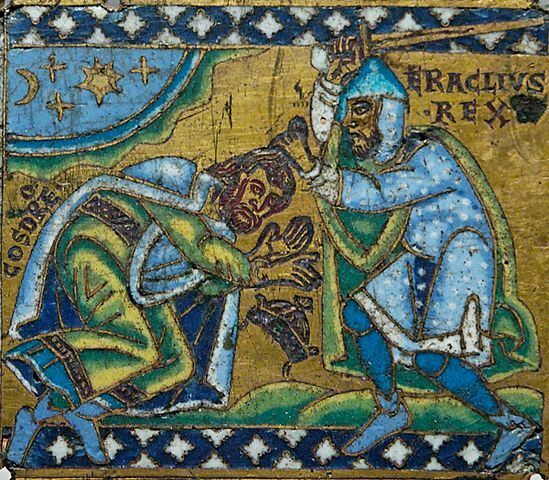 While Phocas did not last long on the throne, the Heraclian Dynasty did not succeed in stabilizing the realm. Instead, a series of invasions and plagues depopulated the cities and led to extensive territorial losses. At the beginning of the dynasty, the Empire was still recognizable as the Eastern Roman Empire, dominating the Mediterranean and harbouring a prosperous Late Antique urban civilization. By the end, the realm had been reduced to little more than the capital, Anatolia, and some scattered territories in Greece and Italy. The last two decades of this era were dominated by a rapid succession of emperors, all of whom were inefficient in turning back the Arab conquest. This period is sometimes referred to as ‘20 years of anarchy’. The period ends with the ascension of Leo III ‘the Isaurian’, who would turn back the Arabs in 718 – but who also banned religious images, kickstarting a religious division which would come to dominate Byzantine politics for more than a century.